Lichen planus or LP is a skin disease characterized by a raised or swollen itchy rash on the skin. It usually is found on the ankles, inner part of the wrists, the forearms, but any skin area of the body can be affected such as the skin inside the mouth, the genital skin, the scalp, or the nails. This inflammatory skin rash can appear as shiny and purple or reddish-purple (also often described as lilac or violet) in color and the rash bumps tend to have flat tops. The bumps may contain very small white flakes and can grow together and result in large patches of affected skin. About 2 percent of the population is affected by this inflammatory skin problem. There appears to be no preference as to whether males or females are affected, although mouth LP tends to affect women more in the ratio of 2 to 1. There is a greater incidence among middle aged (the 30 to 60 year old range) adults. 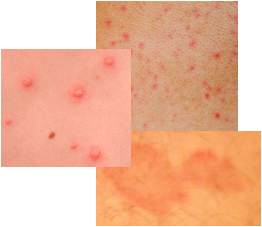 This skin rash problem cannot be spread from person to person. If LP affects the scalp, hair loss may occur. If it affects the nails, brittleness of the nails or split nails are noticeable symptoms. In the mouth, LP is characterized by blue-white patches, bumps, or streaks on the inside of the cheek or on the tongue and sometimes even the gums are affected. Mouth lesions in the form of ulcers can develop, making the skin condition painful. The causes of lichen planus are unknown. It is suspected as being an autoimmune disease, or possibly caused by an allergy to medications used to treat high blood pressure, heart disease, or arthritis. Long term exposure to a variety of certain chemical substances may also lead to an increased risk of developing LP, but often these substances simply lead to rashes similar to lichen planus. There also may be a link to hepatitis C. Like many other skin and health conditions, stress seems to be an aggravating factor. Sometimes LP starts to appear in areas of a previous skin injury – where a scar exists from a scratch, cut, or scrape. In general, LP does not require treatment and will disappear on its own, but rather slowly over a 3 month to a year and a half time period. Brown or grey marks on the skin can remain after healing. These marks might fade, but it can take months or years. If the symptoms of this skin rash are severe, then a treatment will be required. The treatments are to ease the symptoms and are not a cure for this inflammatory skin rash condition. Another case where a treatment is required is the presence of mouth ulcers. Mouth ulcers can lead to a greater risk of developing oral cancer if left untreated for a long period of time. When LP occurs on the nails or scalp and nail damage or hair loss has occurred, then these types of damage are often permanent. Treatments for lichen planus may include: antihistamines to relieve the skin itch and inflammation, immuno suppressing medication, lidocaine mouth wash to numb the mouth ulcers, topical corticosteroids, oral corticosteroids, corticosteroids injected right at the affected skin area, topical creams containing retinol, and possibly ultraviolet light therapy (PUVA). Consultation with a dermatologist is highly recommended to get a proper diagnosis and a proper treatment routine if the skin rash is indeed diagnosed as lichen planus.